A maze game with some similarities to Mr Do! 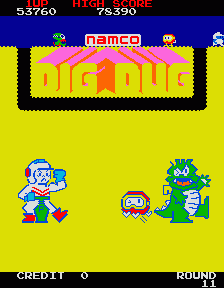 in its style, Dig Dug sees you in control of a little guy in a spacesuit in his mission to rid the screens of the Pookas and Fygars. You are armed with a footpump which you can use to inflate the monsters until they explode. You can also drop the rocks in the maze onto the pursuing monsters to kill them. Pookas are fairly predictable and simply follow you around the maze, while Fygars have the extra ability of fire breathing. You lose a life if the fire comes into contact with you, are caught by a monster, or crushed by a falling rock. If left for too long the monsters "ghost out" and can dig through the earth and will home in on you. You can inflate a monster while it is in its ghosted state, so catch it through a thin layer of dirt to kill it while you are safe. The level is cleared when you kill all of the monsters or the last monster runs off the gameplay area. 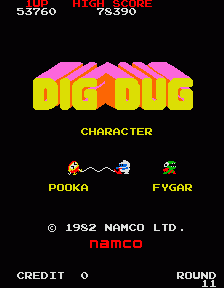 On later levels more Pookas and Fygars are on each screen and they move faster while your speed does not increase. Digging out a segment of earth: 10 points. Inflating a Pooka until it explodes: 200 - 500 points. Inflating a Fygar until it explodes: 200 - 1,000 points. Killing a monster with a rock: 1,000 points. Killing two monsters with one rock: 2,500 points. Killing three monsters with one rock: 4,000 points. Collecting the bonus item in the centre of the maze: Carrot - 400 points; Onion - 600 points; Cucumber - 1,000 points, Aubergine - 2,000 points; Cloverleaf - 3,000 points; Tomato - 4,000 points, etc. Extra life can be set to none or varying scores (default is 20,000 and 60,000). Game continue after all lives are lost can be set to on or off (default is on). Game difficulty can be set to Easy, Medium, Hard or Expert (default is easy). To kill a monster more quickly run towards it while rapidly pressing the pump button until it explodes. You can walk through partially inflated monsters. Watch out though, as they deflate if left alone and start moving again once completely deflated. The last monster on the level will usually try to escape. It will always head for the top left corner of the screen. You can wait for it to get there and kill it before it leaves the screen. Fygars fire breathing has a range of two squares horizontally. You are safe if you are directly above or below them. The bonus vegetable appears on each screen when two rocks have been dropped, regardless of whether they killed monsters or not. 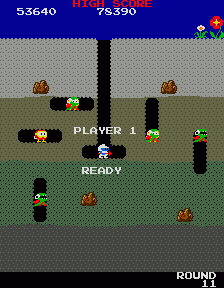 Try to lure the Pookas and Fygars under the rocks by digging long vertical tunnels up to a rock, and then waiting for them to be on the same column as the rock. Then move to one side and drop the rock, hopefully killing more than one of the monsters at once for higher scoring.